Chesterfield real estate is made up of both established and newly constructed homes. These single family homes offer floor plans with 2 bedroom, 3 bedroom or 4 bedroom options. Homes for sale in Chesterfield MO range in price from approximately $150,000 to approximately$900,000. The median home price in 2014 was approximately $340,000. Residents of Chesterfield MO real estate are never at a loss for things to do with their own 4000 capacity Chesterfield Amphitheatre. This venue offers a summer concert series, movies in the evening and festivals throughout the year including a popular Wine and Jazz Festival. The Chesterfield Family Aquatic Center that features a lazy river, three slides, a splash playground and a competition pool. Chesterfield offers over 300 acres of parks and provides the Chesterfield Levee Trail which will be a 17 mile paved loop when completed. Perfect for running, biking or inline skating. You will not find better shopping in all of St. Louis county; home of St. Louis Premium Outlets with over 90 outlet stores including many high end designers. If that is not enough there is also Taubman Prestige Outlet and Chesterfield Mall. Chesterfield also offers hundreds of restaurants with a diversity of cuisines. There are two accredited public school systems in the Chesterfield School district: Parkway and Rockwood. Within Chesterfield are also a variety of private and parochial schools, fully accredited universities and graduate programs which also serve Chesterfield MO real estate. Parents will be happy to know that these are some of the best schools in the area. The city also has four private elementary schools: Chesterfield Day School, Chesterfield Montessori School, Ascension School, and Incarnate Word School. Finally, if you’re interested in learning more about selling a home in Chesterfield MO or buying a home in Chesterfield MO, please contact St Louis County real estate expert, Sharon Colona and St. Louis Realty for a professional and simple buying or selling process. Call (636) 397-7653 or email at scolona@stlouisrealty.net. One of the landmark country estates off of Wildhorse Creek RD. Majestic 9 ac +/- property with 1.5 story Colonial w/ vistas overlooking the Chesterfield Valley. No need to look any further,This 5 BR boasts of a 2 story entry foyer , a solarium leading to the huge great rm ideal for large gatherings and a step down living room w/ beamed vaulted ceilings, wet bar & windows that overlook the amazing infinity pool. Beautiful open kitchen w granite counter tops, stainless steel appliances, walk in pantry, breakfast rm & charming hearth room.Privately situated main floor master suite has a coffee counter,a fireplace, plus, his & her separate baths, dressing areas, plus a 2nd washer/dryer.The 2nd floor offers 3 more BR & 2 full baths.One of a kind walkout finished LL with a large Rec Rm, many options of a BR, office, kitchen, dining area, exercise room, full bath, half bath & steam shower.6 stall barn for horses.5 Car garage. THIS ONE OF A KIND SPECIAL PROPERTY WILL BE YOUR LIFESTYLE! Amazing opportunity to own over 9 acres in the heart of Chesterfield & Parkway schools! 1 Haybarn (~3 acres) & the adjacent 15 Haybarn (~6 acres) combine to create this divine property off a private street on which for you to build your dream home with endless outside amenities (property currently boasts both a pool & tennis court) while still having the maximum privacy one can expect given its in a densely populated professional corridor with a daytime population of over 82K employees within 3 miles. You'll enjoy easy access to I-64 (+/-140,000 vpd), Chesterfield Pkwy, South Outer Forty, and Shoettler Road. This ideal location further allows quick access to over 2,000,000 square feet of amenities within Chesterfield Valley. The zoning (NU & R1) allows you to build additional homes on the property - so bring your inlaws along, keep your older children close (but not too close), or be able to handpick your immediate neighbors as you sell them their lots! Don't wait to make an offer!!! RETURN TO AN ERA OF GRACIOUS LIVING IN THIS FULL BRICK, COLONIAL-WILLIAMSBURG 2-STORY on 7.3 AC Designed by Arthur Johnson in 1955 on the original Kehr family farmstead. The Main Home, Guest House & Pool are surrounded with century old, forged iron fencing, brick walkways & patios. This lovely estate is in the Heart of Chesterfield, yet lives like a private nature reserve. 11 Room, 4Br/3.5Ba has wide plank, red oak flooring, 2 fireplaces, historic, locally resourced barn beams, brick flooring in breakfast room & butterie (pantry), plus a sunroom with tiles from Sicily. Spacious 2 room/1 bath guest house with garage & basement serves as changing quarters for pool & provides main floor space for office or hobbies. Suitable for horses, 3 acres with Kennelwood underground fencing is in place for pets. No subdivision indentures. BACKS TO COUNTRY PLACE. LIST OF MANY OTHER SPECIAL FEATURES IS AVAILABLE ON A SEPARATE DOCUMENT. Adjoining 3 acre lot is for sale, listed at $399,000. Elegance and class in this custom 1.5 story villa! Chesterfield's finest 24 hour gated community. This villa should be at the top of your list! Almost 6,000 sq ft of custom quality amenities. Elevator to all levels. Main floor features in the formal dining room, butler's pantry, great room office AND large enclosed porch! Hardwood floors. Kitchen amenities: Upgraded appliances (Thermador, Bosch, Subzero), gas cook top, granite counters. Master suite includes a separate dressing room and master bath w/marble counters & floors, Jacuzzi, custom built-ins. Two additional bedroom ensuites on the second floor! And a playroom/sitting room & plenty of storage. In the walk-out lower level you'll find a spacious recreation room with gas fireplace, exercise/hobby room, fourth bedroom, 1 1/2 baths, kitchen AND a second screened porch. Backs to trees! Privacy! xD; xA;convenient location and 24 our gated community! Why wait for new construction to be built? Marvel at this magnificent well-appointed home in Greystone situated on a quiet one-acre cul-de-sac lot. With Spring around the corner, enjoy the private saltwater pool oasis surrounded by the serenity of gardens & trees. Finished walk-out lower level w/stone bar is an amazing entertainer x2019;s dream. Grand entry w/inviting neutral hues of color, gleaming wood floors & gracious embellishments. An elegant dining room ideal for formal gatherings. A private office w/bookcases. The great room is a showstopper w/floor-to-ceiling windows & incredible year round views. A gourmet kitchen centers the home w/custom cabinets, granite, stainless appliances, tile backsplash & pantry. Open flow to breakfast & hearth room w/access to decks & screened porch. The main floor master suite is a restful retreat offering a spa-like bath w/dual sinks, jet tub & shower. Upstairs is a bonus room and 3 spacious bedrooms each with its own bath & walk-in closet. A rare find! This custom 1.5 story is truly exceptional! Situated on a quiet cul-de-sac & a gorgeous private lot backing to trees w/ an inground pool & exquisite screened-in porch perfect for entertaining & enjoying the fresh air w/ vaulted ceilings & built-in heaters. 2 story entry w/ charming staircase opens to a private study w/ built-ins & a spacious dining rm w/ a framed tray ceiling & wood floors. The 2 story great rm w/ floor to ceiling custom windows & wet bar opens to the updated gourmet kitchen w/ custom cabinetry & crown molding, granite countertops, gas cooktop & new range, & breakfast bar - adjoins the breakfast rm & large hearth rm w/ stone fireplace & custom built-ins. ML master w/ sitting rm & fireplace & updated lux bath. A 2nd bedrm/in-law suite can also be found on the ML. 3 addtl bedrms, 2 full baths, & loft/rec rm on the UL. This spectacular home also features ML laundry, built-in grill center, covered patio, extensive landscaping including waterfalls & fountains, & much more! This dramatic 1.5 story Country French Oxford Plan Masterwork Series offers superb design and exquisite finishes throughout +6000 sq ft of finished living space. This Miceli built display home offers exceptional craftsmanship and custom millwork. The two story great room offers a fireplace, built in bookcases and wet bar that joins the large kitchen. A cooks dream kitchen includes an open floor plan, granite counters, stainless appliances, large pantry, custom cabinetry and breakfast room adjoining the beautiful hearth room. This lovely 4 bedroom, 4.5 bath home features a coffered ceiling in the master bedroom suite with a luxurious bath. The upstairs offers 3 bedrooms including a bedroom suite and loft area. The finished lower level offers a gas fireplace, wet bar, full bath, extra sleeping area and plenty of storage. The professionally landscaped yard is complete with a gorgeous salt water pool, covered patio and a hot tub that is perfect for family entertaining. Your ULITIMATE PRIVACY in a park-like setting on 8.2 acres in PRIME close-in Chesterfield location. Custom 1.5 story 6BR/5BA estate home with 7,720SF TLA plus 2,552SF of covered & uncovered custom concrete decks and patios. Indoor/outdoor pool. Updates/renovations include, but are not limited to: bathrooms, kitchen, patios, decks, exposed aggregate driveway, #1 heavy wood shake roof, poolhouse roof & sliding doors, carpeting & painting. Use 1 or 2 BRs as offices. Irrigation system. Tennis/Sports court and/or Stable/horses option available. This outstanding location avoids heavy traffic. Minutes from highway 40/64, shopping & dining. 10 mins to 40/270 & major hospitals. This home is perfect for entertaining family & friends. This home has an abundance of special features. Please see renovation and replacement cost reports. Some acres can be split to create buildable lot. MOTIVATED SELLER! MUST SEE! CAR COLLECTOR? 2 separate finished & painted garages w/ lift system can store up to 8 cars! Stunning architectural design & details throughout this breathtaking masterpiece! Richly appointed 1.5 story resting on plush 1.5 acres! Dramatic 2sty foyer w/ Swarovski crystal chandelier mounted on electric hoist. Great rm boasts Asian Walnut hardwd, tray ceiling, moldings, frplc, built-in bkcases & wall of wndws w/ transoms. Chef's kit w/ center island, granite, 42' custom cabs, Dacor appl, paneled fridge & dishwshr, bkfst rm w/ French doors to 4 season rm & even a separate fry kitchen. Distinctive hearth rm w/access to patio. Bayed mastr ste is fit for royalty featuring a most lux bth, sep vanities, regal jet tub & dual head shower. At the landing is a sophisticated vaulted study. Upper level hosts cozy loft area, 1BR ste & 2BR's w/ Jack& Jill bth. W/O LL w/impressive 2 sty bonus rm & storage areas. 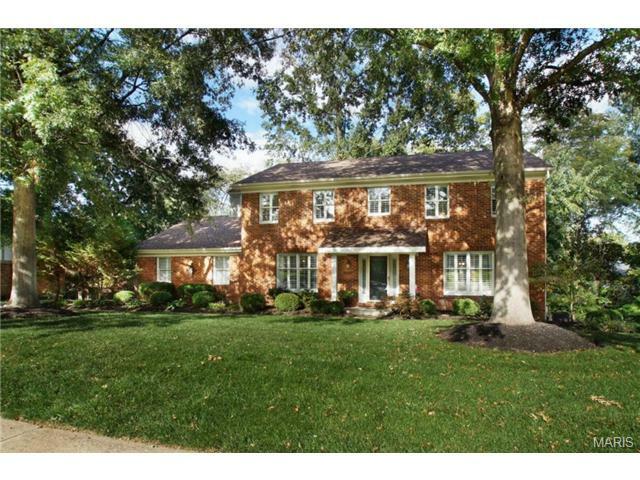 Expansive deck, patio w/waterfall.Close to Chesterfield Valley & Rockwood Schools. Impressive brick & stone 1.5 story home with oversized 4-car garage! You will know elegance once you x2019;ve entered the beautiful custom iron & glass drs to the 2-sty entry. Wood floors throughout this exquisite home. Beautiful formal Dining Rm, crown molding, chair-rail & wainscot. Kitchen is a gourmet cooks delight with 2 SS dble convection ovens, built-in refrigerator, microwave, & gas cooktop. Large island with double stacked edge upgraded granite. Open to Brkfst rm & charming hearth rm with stone fp. Gorgeous Grt Rm, 2-sty windows, fp with gas logs. Main flr master, lrg walk-in closet, spa like master bth, double vanity, shower with dual controls, heated flrs a plus! 2nd flr has 3 additional BR, one with its own private bath, the other 2 share Jack-n-Jill. 2nd flr bonus rm with surround sound. Main floor Russound multi-room audio system. Main flr laundry, large walk-in pantry. Many custom finishes throughout. Must see to appreciate the added value put into this magnificent home! Make this luxury home in this charming neighborhood yours. This home is stunning inside and out. The outside features a pool area with privacy provided by the landscape, a fire pit area, and seasonal blooming gardens. The main floor of the home features any cooks dream kitchen with all new appliances, countertops, and custom cabinets. Also on the first floor you will find a living room, dining room, family room, an office, and a laundry room. The main level floors are refinished hardwood. The second floor has a stunning Master Bed and Bathroom with heated floors and 2 large walk-in closets. The second floor also features a Jack and Jill bedroom, bathroom combination and an additional bedroom with an en-suite bathroom. The basement is perfect for entertaining with a wet bar, entertainment room, and room for a pool or other game table. The basement also has a bedroom and en-suite bathroom. Elegant, Stately, Serene and beautifully updated 5BR/5BA w/over 6500 sqft of living space! This stunning 2 sty offers wonderful amenities for family living and entertaining. The magnificent grounds include a impressive SALT WATER POOL, hot tub, paver patio with stone fireplace, outdoor kitchen and plenty of space for kids and pets to play, all on a private .91 acre lot backing to trees. Chef's gourmet kitchen featuring Wolf, Subzero, Thermador & Miele appliances. Adjacent hearth room w/vaulted ceiling and Heat & Glo gas fireplace. Elegant staircase that leads you upstairs or down with a huge palladium window overlooking the picturesque backyard. Master suite w/newly remodeled luxury bath, his/her walk in closets. 3 additional oversized BR's (1 ensuite and 2 share jack & jill bath) all with walk-in closets. Walk out LL w/ family room, 5th BR & workout room. Oversized 3 car garage w/epoxy floor and organizers by Premier Garages. Plantation shutters throughout,NEW ROOF & Rockwood schools! WHY BUILD when you can own this spectacular 5 bedroom 1.5 story home with over 6500 sq ft of finished living space? Beautifully appointed amenities with a soaring open great room & kitchen, 3 fireplaces and a magnificent walk out lower level! Situated on a wonderful walk out lot with spacious paver patio, composite deck, hot tub & stone fire pit. Upgraded amenities such as built-in great room cabinetry, refinished hardwood floors, triple zoned HVAC. Spacious lower level with custom stone and granite wet bar, wine fridge, ice maker, media area with 110-inch projection screen, 5th bedroom & full bath. Luxurious custom office with signature mill-work, crown, casing, base moldings, 13 ft high ceilings & rich cherry wood wainscoting. Main floor laundry with spacious built in storage lockers. Upstairs bedrooms have walk in closets, full baths & Jack/Jill bath. Countless fine qualities & amenities in this impeccable Flower built home. Great Chesterfield location & AAA rated Rockwood Schools. Welcome to this beautiful Villa found in a gorgeous, gated neighborhood. Upon entering you will be whisked away by the exquisite condition of this remarkable home. The dark hardwood floors, open floor plan, 10 ft. ceilings and custom finishes make this property very special. There is a large entry and a charming dining room found on your right, followed by a butler x2019;s pantry, which includes a second dishwasher, wine fridge and great additional cabinet space. Conveniently, the kitchen follows, with 2 eat-in areas, high end appliances, beautiful finishes, and is open to the great room. The generous great room opens to a screened-in porch with stamped concrete flooring. Also on the main level, the impressive master suite, which includes an office, large bath and master closet. Upstairs is a bonus space and two en suite bedrooms. Finally, the amazing lower level; 9ft ceilings, a bar, a recreation area, bedroom, bath and plenty of storage. The lower level walks out to a great covered porch. This stunning Fischer and Frichtel home is under construction and ready for sale at Warwick on White Road. A private enclave of 10 homes, in the heart of Chesterfield. This home situated on a walk out homesite on a cul-de-sac. Features 4 bedrooms 3.5 baths, a large bonus room and over 4000 square feet. Custom 1.5 story 6BR/5BA estate home on 3.5 very private acres in a prime Chesterfield location. 7,720SF TLA plus 2,552SF of covered and uncovered custom decks and patios. Many recent updates and renovations, including but not limited to: bathrooms, #1 heavy wood shake roof, poolhouse roof & sliding doors, carpeting and painting. 2.5 acres of irrigated lawn grass. 2 BRs may be used as offices. 4.7 additional acres (buildable) available for purchase & may be used for horses or future development. This outstanding location avoids heavy traffic and is only minutes from highway 40/64, shopping, dining, and 10 mins to 40/270 & major hospitals. This home is perfect for people wishing to entertain family/friends. The ultimate in privacy and park like views. This home has an abundance of special features, please see attached list for more information. Stately Town & Country Williamsburg 2 story offers your hearts desires. The leaded glass panel entry xD; xA;offers a fabulous view of the foyer and staircase. Traditional center hall plan with an enormous dining xD; xA;room and living room. Both rooms have large bay windows. The Family room has 9 x2019; coffered ceiling, xD; xA;FP, dry bar, and 14 x2019; bay window overlooking the pool area. Kitchen area with high end custom xD; xA;cabinetry, 8 x2019; island, extensive granite counters and SS high grade appliances. The MBR en suite has xD; xA;10 x2019; coffered ceiling in the bdrm, vaulted ceiling in the spa like master bath and travertine marble floors. xD; xA; In addition the 2nd floor has 3 additional bedrooms and an additional full bath. LL offers a 6 x2019; wet bar xD; xA;and mini kitchenette with solid surface counters, 5th bedroom, another full bath, rec room, media room xD; xA;with FP. Walk out to the fabulous rear yard and pool area. Luxury free form pebble sheen Baker xD; xA;heated saltwater pool.